FAST, CHEAP & FREE UK delivery! 'No quibble' guarantee, excellent customer service, secure online shopping. 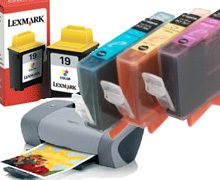 We manufacture compatible and remanufactured ink cartridges. This means that by cutting out the 'middle man' we can offer the best quality products at the UK's lowest prices. Each of our remanufactured cartridges has been factory cleaned, refilled to the maximum capacity and thoroughly tested. In short we are dedicated to supplying the highest quality products to individuals, businesses, government and educational institutions worldwide.